The local Roman Catholic diocese doesn’t agree. If we define religion as a deeply-felt experience, as many in our field and the public at large do, then it’s easy to see how that feeling pops up in surprising cases — hence the virtually limitless application of the “religion and…” formula. For now we can study how this feeling impacts everything from literature, cooking and pop culture to, well, you get the idea. But if, instead, we shift our attention to that very designation itself and what comes of calling this or that “religious,” then an equally surprising number of things become relevant to study, for a rather different reason. 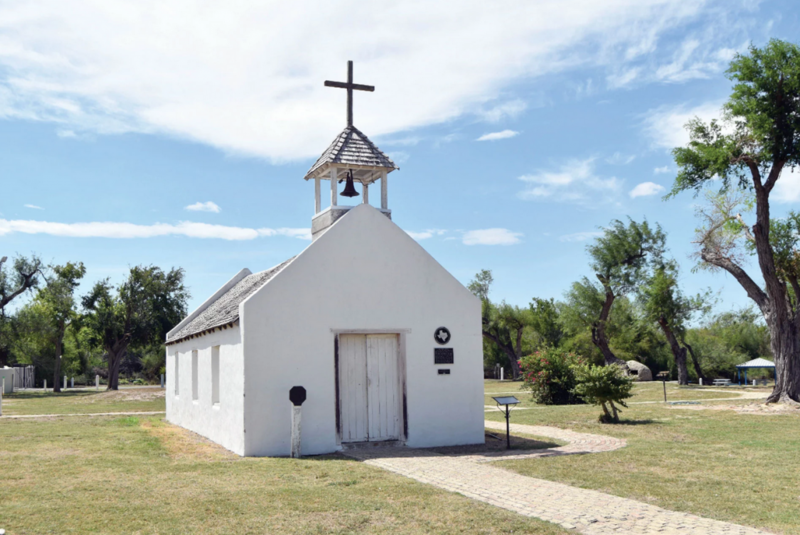 For example, consider that dispute over the land on which the La Lomita chapel is built. For in response to the Federal government’s interests the lawyers for the diocese have argued that this incursion of government impairs their parishoners’ rights to freely exercise their religious beliefs, making this a First Amendment case, and thus one in which the state had better have a rather compelling reason for overriding the freedoms established under the Bill of Rights. Listen to a story on this here or play it via the embed below. Or what about another story in the news this week, one that played out here in Alabama but which made the national news: a man sentenced to death was denied the right to have an imam (a Muslim prayer leader) present with him in the death chamber at the time of his execution. While a lower court disagreed with the prison declining his request, the US Supreme Court said, in a 5-4 decision, that the execution could proceed — and it did, the other night. Why might a scholar of religion find this case interesting? Well, the prison employs a Christian chaplain who remains by the convicted killer’s side throughout the execution, but would not allow a non-Christian the same rights (his imam attended but watched from behind glass in the adjoining room), thus setting up the appeal to postpone the execution until the state of Alabama could provide an imam to perform the same role for this man. Otherwise, or so it was argued, his rights under the Free Exercise clause would be denied; of course, one could equally make the case that the prison’s policy of exclusively authorizing a Christian ritual specialist “respected the establishment of religion,” by favoring one among many, thereby making their routine practice problematic for yet another reason. But a majority in the Supreme Court, in a decision that struck those dissenting as controversial, allowed the state to go ahead, in part saying that the man waited too long to make his appeal of the practice. Again, for the scholar of religion interested in the practical effects of classifying something as religious — such as the way, at least in a liberal democracy such as our own, that this designation can be used to privilege some actions and organizations over others — this case is no less fascinating than the one of the La Lomita chapel. For in both cases social actors have used the designation in arguments against the power of the nation-state. 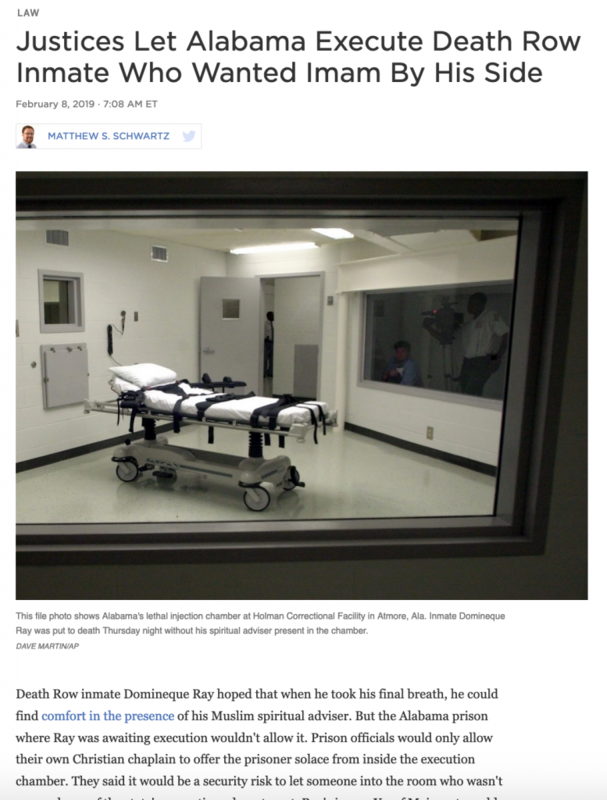 In one case, that of Domineque Ray (who was convicted of a 1995 murder), the argument wasn’t successful and he was put to death a couple nights ago. But for the other the jury is still out, since no work on the wall has yet begun and the Federal government so far only has permission to begin surveying the land for its possible construction. By the way, that one case involves a minority (and for some in the majority, a controversial) religious position in the US (Islam) while the other a dominant and thus widely accepted one (Christianity), makes juxtaposing these two news items all the more interesting. Studying each, or both together — let alone the many other moments when the state bumps up against items classified as religious — would make for a fascinating project. 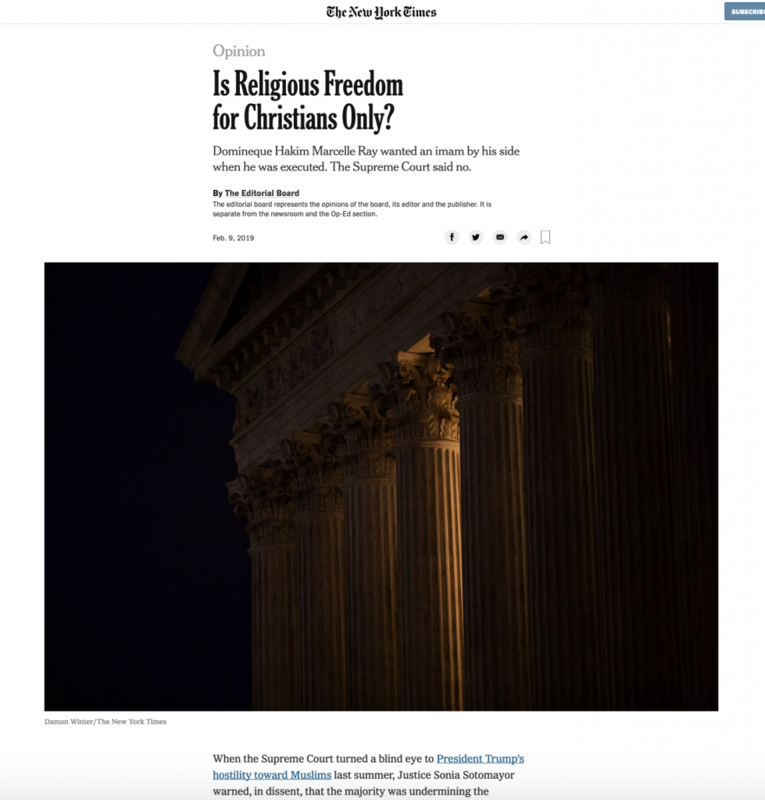 For, contrary to the New York Times editorial, sometimes even Christians seem not to be tolerated by the state. This entry was posted in Faculty Blog, Relevance of Humanities, Religion in Culture and tagged Alabama, Christianity, Establishment Clause, Execution, First Amendment, Free Exercise Clause, Imam, Islam, La Lomita Chapel, Mission Texas, New York Times, Toleration by Russell McCutcheon. Bookmark the permalink.